Handpainted needlepoint canvases are a joy to stitch. The artist has accurately stitched painted the design on the canvas. The stitcher will choose the threads and embellishments for the canvas. It is fun to choose from Persian, floss, perle cotton. Sea Needles has metallic, fur, sparkle braids, Krenick filaments, etc. to further add to your stitched piece. 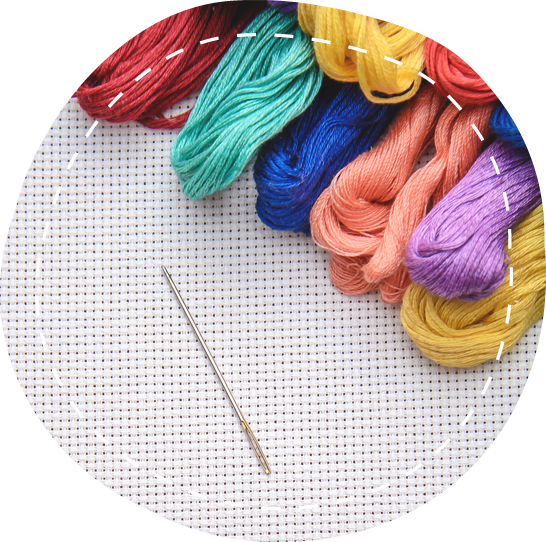 By using different threads, fibers and stitches, you can make your needlepoint your own distinctive, designer canvas! Beginner and some needlepointers may prefer to choose a kit which is screen painted on the canvas and includes yarn or floss. Sea Needles has a large selection of canvases in different size mesh and designs. Check out the local canvases we have for the beaches and local landmarks. We include Jewish designs, rugs, eyeglass cases, scissors cases, purses, geometric designs, Christmas ornaments, Christmas stockings, floral, animals, birds, etc. Some of our designers are Needle Crossings, Danji, Point of It All, J Child, Studio 2, Mindy, Leigh, Julie Mar, and Alice Peterson. Our needlepoint threads include Waverly Persian wool, embroidery floss by DMC or Anchor, Rainbow Gallery Fibers, DMC Perle cotton and Silk and Ivory. Other needlepoint supplies are blank canvas, needles, stretcher bars, magnifiers and accessories. We are very glad to give stitching and thread suggestions and the amount needed. Once you have completed your stitched piece, you may wish to either frame it or have it finished into a pillow, ornament, eyeglass case, purse, etc. Sea Needles provides a finishing service. The price includes blocking, backing, filling and a zipper. We have fabric samples that you can choose for your piece. You also may wish to provide your own fabric, however the price will remain the same. To guarantee finishing for Christmas we must have the stitched item by August 31. Finishing usually takes 10-12 weeks and is dependent on when we have several pieces to send. In addition a finishing service for belts is available. Whether you enjoy cross stitching from a kit or a leaflet, Sea Needles stocks a huge inventory of both. You can choose designs from A-Z in patterns and kits. Our selection includes Christmas, beach, baby, designers, country, friends, flowers, home, patriotic, welcome, sports, animals and holidays-to name a few! One of the greatest things about cross stitch is that you can combine patterns to design your own. We carry patterns by local designer Patty Yergy. Patty specializes in samplers and has several new beach themes! 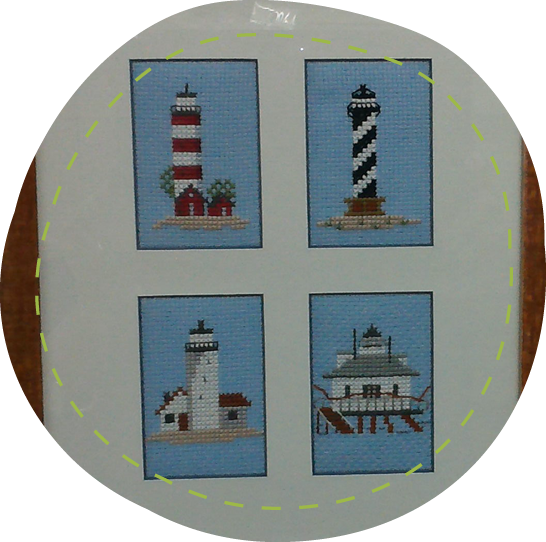 Sea Needles is proud to offer unique, exclusive beach and local landmarks cross stitch kits by Nancy Dorman. These kits can be stitched quickly and can serve as a great hostess gift or souvenir! Cross stitch supplies include needles, Aida fabric in size 11, 14, 16, 18 tubes (15”x18”). Linen fabrics in 28, 32, and 36 are available in a number of colors. We can special order fabric, (minimum of ¼ yd) if you don’t see a color or fabric you need. Our threads are Rainbow Gallery, Krenikfilaments in blending, size 4, 8, 12, 16, 24, and 32, DMC floss and perle cotton, Anchor floss, Weeks Dye Works and Gentle Arts sampler threads. You can enhance your cross stitching with buttons and beads. We carry Mill Hill Seed beads and Just Another Button Company buttons to complement your needlework!